When commercial real estate firm JLL chose its new D.C. headquarters at 2020 K St. N.W. last year, it wanted the 72,000-square-foot space to be a more efficient workplace for employees that created a sense of unity and teamwork, and an internal cafe was part of the plan. WASHINGTON — When commercial real estate firm JLL chose its new D.C. headquarters at 2020 K St. N.W. last year, it wanted the 72,000-square-foot space to be a more efficient workplace for employees that created a sense of unity and teamwork, and an internal cafe was part of the plan. Also, JLL employees wanted to pay tribute to their favorite watering hole, Mackey’s Public House, at their new office space, and named the new in-office cafe “The Mack.” It even includes a vinyl reproduction of the Mackey’s Public House facade when it was located at 19th and L, created by local artist Maggie O’Neill. JLL is not alone in rethinking kitchens and common office spaces. The office kitchen in the D.C.-area is increasingly not just a Mr. Coffee and vending machine, and amenity-rich work places are no longer confined to just high-paying tech companies and law firms. Surveys, like a recent one from employee satisfaction research firm Leesman say office amenities provide employers plenty of bang-for-the-buck when it comes to keeping employees engaged and productive. At Capital One Financial’s sprawling Tysons Corner campus, common spaces look more like restaurants and living rooms than kitchens and conference rooms. Another survey by Capital One of 2,500 full-time professionals in D.C., Chicago, Dallas, New York City and San Francisco found that the top-ranked on-site benefit employees want is access to healthy food and beverage options. So it is not just the kitchen, cafe or cafeteria. It’s the food. “Employees want their employers to create an office kitchen that has a salad bar filled with options — artichokes, brussels sprouts and steak, versus just lettuce, tomatoes and cucumbers,” said JLL’s Mid-Atlantic Market Director Chris Molivadas. “Organizations are creating a vibe of a cafe, but instead of doing that in retail, you are doing it in your own space, which provides collisions and interactions, and people-watching in the office. It gives you a different experience. People (here) are foodies. They pay attention to the quality of the food,” Molivadas said. If a company is providing meals to employees, someone needs to provide the meals to company, and that is a business that is growing for D.C.-area caterers. Alexandria, Virginia–based Seasons Culinary Services operates on-site cafes under the name “Seasons” as staff restaurants at office buildings. “The word ‘cafeteria’ evokes an atmosphere where customers pick up a tray and are ushered through a buffet line to make meal and beverage selections, but today’s customer is food-savvy and enjoys cutting-edge environments where extraordinary food and coffee offer a hip, local approach that together inspires conversation and connection,” said Seasons’ Mary Kate Spainhour. “In-office food service has the benefit of being convenient, affordable and reliable, and contribute to employee recruitment and retention,” Spainhour said. Free pizza is always an office hit, but employers now find that, when given a choice, employees prefer healthier options. Those providing catered food service stress organic, farm-to-table and locally sourced. As Seasons puts it, employees prefer the notion of a “staff restaurant” to just a kitchen or cafe. Picture pomegranate salmon or seaweed salad, instead of a Quizno’s sub or Quarter Pounder with cheese. Office kitchen trends also run the gamut, from open kitchens with all the bells and whistles and designs of restaurants, to micro-kitchens, micro-markets, pop-up restaurants and food carts. And office kitchens can double as client event spaces. Higher-end office kitchens — and other “social” common spaces — mean added expense, but landlords are taking on the costs, though buildings that carry “specialty spaces” are reflected in the cost per square foot. Class B buildings are competing with trophy-class office buildings by renovating lobbies, adding fitness centers and rooftop spaces to reflect the new social trends and creating what interior design firm Hickok Cole calls a “membership feel” to their buildings. Adding in-office cafes and social spaces also does not always equate to higher costs because companies are decreasing individual-assigned spaces per employee, reducing square footage while gaining social spaces for the entire staff. JLL says companies are employing more low light and windows into their kitchen spaces, and creating a mix of seating options, such as low tables, high tables, soft seating and the industrial look is very in right now. “At some restaurants, you’ll find they use hard surfaces to sound vibrant and louder, filled with lots of energy, but in an office space you want to show activity but not with noise. You want to control noise so people are involved in an active environment but they can work and hear each other,” JLL’s Chris Molivadas said. And when it comes to location of office space, the penthouse is not always tops. Traditionally, the higher the floor, the higher the rent, but upper floors are not necessarily the most desirable for office space anymore. Employers are finding that their workers care about how “green” the office space is. “Green” can refer to the march toward LEED certified, eco-friendly building infrastructure, but it also refers to plants. And the sad, lone, wilted fern next to the sink is no longer nearly enough. 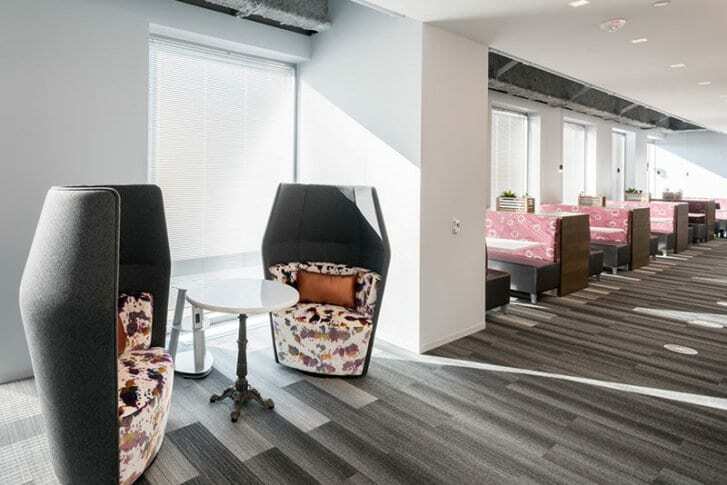 “Connection to outdoor spaces and integration of greenery within cafes is a trend that many organizations are integrating in today’s workplace,” said Maples. “Science and the study of individual wellbeing support the use of Biophilia in the workplace as a means to recharge and connect to nature. A positive mental shift occurs when we have this connection to nature,” Maples said. Seasons says millennials are driving the move toward more amenity-rich kitchens, and food and coffee are highly-valued perks. There is now demand from younger office workers for technology as well, with payment-by-phone options, menu apps, online ordering, loyalty programs and after-hours, self-service markets. And millennials like their coffee, whether traditional, cold-brewed, nitro, or superior coffees with a local connection. The office coffee bar amenity has become a new conversation and collaboration space. At JLL’s The Mack, the goal was in fact a coffee-centric cafe complemented by great food choices, and that prototype at its Mid-Atlantic headquarters now serves as the model for what it is incorporating for tenants at other JLL properties. The WTOP staff itself will soon experience a “social cafe” when the station relocates to its new Chevy Chase, Maryland, location. Gensler’s Sumita Arora said gathering and collaboration potential helped with the design of the new space. “Places like the central café encourage social connections that enrich the workplace experience and support job satisfaction,” Arora said.